This is a change in the rules that might affect most of the golfers. In the past 2 months I received many question on this subject and this is something we won’t see in any professional events. It might be confusing for most of you, but some changes are optional and others are included in the Rules and affect everybody. As an example, the possibility to get out of a bunker for an unplayable ball with a penalty of two strokes is for all the players. 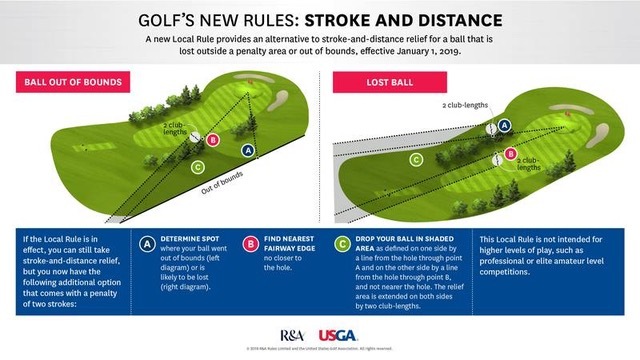 But the alternative to Stroke and Distance is only in effect if the Committee adopted a Local Rule. This local rule applies only for a lost ball or a ball that is Out of Bounds. It is not possible to use that local rule for an unplayable or for a ball in a Penalty Area. 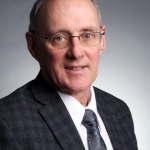 The committee may decide to put that local rule in effect only on one hole or a few holes. We must determine the point where the ball crossed the limit of the Out of Bounds. (Point A) We must find the point B, which is the point on the short grass at equal distance from the hole than Point A. From that point you will drop a ball taking in total a penalty of two strokes. We must determine the approximate area where the ball may be. (Point A). We must find a Point B at equal distance from the hole on the short grass. From there we drop a ball within a club-length, and we count two penalty strokes. This decision will be based on the configuration of the hole. It should contribute to save time. If needed I can go at your golf course and help out on that local rule and other local rules if needed.